I’ve never been to anywhere in the world that could be considered tropical. The closest I’ve ever come is Disney World in Orlando, Florida. While some may call it the happiest place on earth, I don’t think anyone has ever called tropical. That label is reserved for places like Hawaii and the Bahamas. I have no desire to go to these places because they are very hot, and I don’t like extremely hot weather. But if I were forced to go to somewhere tropical at gunpoint, I would imagine drinking this there would be very fitting. While I’m not crazy about coconut water, this one is actually pretty good. It tastes really fresh and has a real creamy taste to it. While the summer heat in Buffalo doesn’t compare to the tropics, this is definitely helping me ‘beat the heat’ as they say. My only complaint about this is you can’t really taste the pineapple. This is disappointing to be because pineapple drinks are delicious and I was really looking forward to tasting the combination of coconut and pineapple. I've missed you. Ever since I moved to the big city, I haven't seen you. Let me tell you a little bit about the city. There are cars all over the street and people walking around and tall buildings. Everyone wears hats, which is a little strange, but it happens. To move from the country to the city was quite a feat. I mean, sure, I only had a few things; button down shirt, one pair of shoes, a pad of paper, and some toiletries. One suitcase is all I ever need. The reason that I am writing you is that the city is stocked with some fancy teas. Not just black tea with milk and sugar for me, gram gram. They've got this stuff that is rose flavored green tea. It reminds me of you because it smells like you. I mean that in a good way. It's bitter, which is what green tea is supposed to taste like, or so I've been told. The taste is like I'm drinking this newfangled green tea through a bed of roses. It reminds me of that stuff daddy brought back from his trip to India for work except it was way tamer. So I guess what I'm saying is that I don't need you anymore. I've grown up into a man and have replaced everyone I know with stuff from around the city so I'm not so homesick. I've met some kids around town that ride motorcycles and has a lot of tattoos and I think that I'm going to start to run with them. They seem like nice enough sorts. Ladies and Gentlemen, in an effort to gain superhuman sight I shall now consume no food other than carrots and drink nothing other than carrot juice. I am sick of this normal vision. I dream of a day when I can read at night and more importantly look through a closet refrigerator door so that I can realize there is nothing I want to eat inside without wasting the manual and electrical energy. I will start this experiment in greatness with this carton of juice. 11.2 fl oz of freedom is what I hold in my hand. Hmm. This doesn’t taste like actual carrots nearly as much as I imagined. Since the only ingredient is organic carrot juice I really expected this to taste like I chewed up a carrot for about 15 minutes. This is actually much sweeter than I anticipated. I would have sworn there was sugar added, but nope. It tastes like a juice of some sort that is vaguely carrot tasting and lightly sweetened. I’m kind of disappointed that it doesn’t taste exactly like carrots, but I but if I drank a juice that did and this back to back, this would win out. Not bad. What’s what Sally? If I eat nothing but carrots my skin will start to turn orange? Well I want no part of that. I will leave the gift of super sight to rabbits and cats. He’s to wasting fridge energy! When a man is broken down the only thing to do is to load his vital stats into a computer and have it create an 80's like line diagram of his body. That way you can use science to fix him, to make him better. After everything is loaded in the best way to proceed is to pour a bottle of this beverage into your disc drive. It will take care of the rest. Sticky circuit boards are what it takes to cure a man. This is rather odd. I don't know whether to call it a soda or a tea. I guess it is both, but I feel like one should have dominance. It is green tea extract added to carbonated water and the only sweeteners in it are the ones that come from fruit juice. That's something I can appreciate. They could have stopped there and had a decent drink, but that's not going to rebuild a man. In their wisdom they added kola nut, guarana, taurine, damiana, ginseng, ginko biloba, suma, gotu kola, echinacea, capsicum, dandelion root, kombucha and others. As a result I think this technically becomes an energy drink instead of a recovery beverage. Who knows, maybe they were able to complete the hybrid of the two with their sticky circuit boards. Flavor-wise this is fairly similar to any carbonated green tea I've had. It has an accurate cranberry taste to it. There was a slight strange aftertaste and it wasn't until after I read the ingredients that I realized it was sarsaparilla. Why that is in there I will never know. I had high hopes for this drink. Zico has had a good track record so far and made us Thirsty Dudes give coconut water another shot. On top of that, pomegranate is one of my favorite fruits. Both are fairly tropical so I figured this would be a good combo, right? Meh. I wouldn't go as far as saying it's a bad combo, but it's not amazing. This has more of a coconut water flavor, but not a whole lot pomegranate (or berry) flavor to it. There is a slight fruit after taste, but not as much as I would have hoped. This is still one of the best coconut waters I've had, but when something is flavored I assume it's going to be a strong flavor and not just a hint. This is something that we don't normally do over here at Thirsty Dudes; explain the origin of a drink. Not history as much as the story of how we got it. 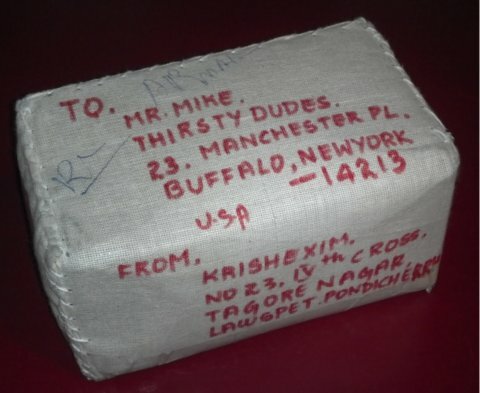 About a month ago I was contacted by Krish from India. He introduced this drink to us. I was honestly about to write it off because I though the guy was trying to give us coconuts, but it turns out that I can't read and he was telling me about a drink that is pure coconut. I have never seen a package like this. It was woven in some sort of cloth. Hand stitched closed and it was done well. This guy was a pro. As I opened it, I thought to myself, "There could very easily be a finger in here. I hope there's not a finger in here." Once I got the woven layer off, there was a paper cover. I removed that to find that there was a box a Christmas lights. I found that odd, but promptly opened it up. There were paper shavings and inside was a small bottle of coconut water. "Pfew", I thought to myself. Now that this isn't a finger or any other sort of appendage, I decided to put it in the fridge and wait for the right time. A few days later and with no real rhyme or reason, I thought that now would be a good time. I pried off the cap to reveal a little divot where a straw would be perfect but since I didn't think of that, I put a knife in it, opened it up, and started drinking. There is nothing in this but coconut and "bio-preservatives" which I can only assume are natural preservatives that will allow the coconut water to keep longer than two days. It's good, too. It's exactly like what I would think cracking a coconut open and pouring it into an adorable container would taste like. The super light, inherent, natural sweetness of coconut mixed with its dry flavor is actually pretty good. Now obviously if you find this stuff, it's not going to come inside an adventure of a container and I was lucky enough to have Kirsh take the time to send it to me, but you will get the same great drink inside. Want to take a trip to an island but don't have the money? Find this stuff, go to a home improvement store and buy some sand, and don't forget the umbrella toothpicks. I hope that you can get it at some sort of Indian market. Perhaps I can get Kirsh to comment and let you know where in the States and abroad you can get it. Carl S. Junior, get over here right now and eat your vegetables. You can't just eat the fruit and then run into the mud like a Peppa Pig. I'm sorry, Sharon. Carl is being a bit of a bother. He doesn't like his vegetables. Try what? V8? Sharon, did you listen to me? I said he doesn't like vegetables, not loves them so much he wants to drink them. I swear, Sharon, sometimes...CARL! Get off of Mr. Draper's cat. Manny does not like to be pet that hard and especially not with muddy hands. I'm sorry, Sharon, you said there was a different kind of V8? V-Fusion? I've never heard of it because I haven't been to a grocery store in about four years. It's a full serving of both fruit and vegetables and doesn't taste like vegetables? Sharon that would be the answer this current situation right now. You know, the one where Carl Jr has climbed Mr. Draper's tree and is readying himself to jump onto his roof if I make him eat another pea. Can I get this anywhere? Yes? Remarkable. Seriously, Sharon, how does it taste. Just like Concord grape juice and a little bit like raspberry? My idiot son can't read so he won't be able to see that it's good for him but he knows what a carrot is so I am going to have to pour this into a cup so he doesn't know that there are vegetables in it. I don't mind lying to Carl Jr, Sharon. He's a kid. He'll believe anything. It's almost not lying if it's good for them in the end, right? Sure. I've got to go, Sharon. "Uncle" Tom is here. Hey, he likes having an uncle and I like that "uncle" Tom lets him play video games while we work on...you know...no Sharon. He comes over and helps me garden. I said it like that because he isn't a real uncle. Jeez, Sharon. Sometimes I don't know why we're friends. Imagine you are on a sandy beach in the Caribbean. You have just gotten back from snorkeling and swimming with dolphins. Yes, you did hold on to their fins and yes you did name one "Echo". You had to, even though you hated the game because it was impossible. You also went on an excursion where you rode a zip-line from one side of a gorge to the other and at the end there were tacos and instrumental covers of Smiths songs played by an indigenous Caribbean steel drum band. You are in heaven. As you sit on the beach and look across the crystal blue waters, a waiter comes by and offers you a drink. You don't care what it is since everything is perfect and nothing can ruin your day. You take a sip...and it's strange. You open your eyes and you've got a can of Arizona's new CocoZona drink. You have to drink it because you don't want to upset the waiter but you only kind of like coconut so every sip is difficult. You start going the other route, which is taking giant chugs to get it over with faster. It tastes like you just took a bit out of a coconut. Yes, I know you can't just do that and machetes are involved in the processing of coconuts, but if you could take a bit out of a coconut, that's what it tastes like. You turn the bottle around and notice that the only ingredient is coconut. Why did you even bother looking? You finally finish the drink as the sun sets and as you get up to go to dinner, a young child comes and punches you square in the bathroom area. Your night has been ruined.